The latest WalletHub report released last week noted that $4 billion in corporate losses are due to unproductive workers during March Madness; $9.7 of the estimated $10 billion wagered on NCAA men’s basketball is done illegally. It’s also “March or Gone” time for some coaches, with a Janet Jackson “What Have You Done for Me Lately” state of mind by athletic directors who issue pink slips and begin coaching searches. Coquese Washington (Penn State) and Daynia La-Force (Rhode Island) sadly are among this year’s coaching causalities who were shown the door after their season concluded. The slogan-laden and male-centric “Road to the Final Four” eventually will wind up in downtown Minneapolis in a couple of weeks. 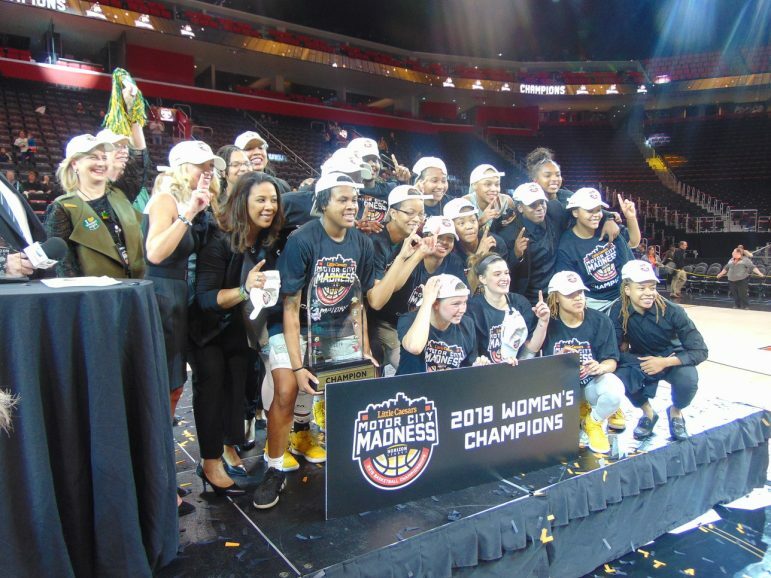 But the last couple of weeks, this columnist instead followed other roads to that other tournament — the women’s NCAA Final Four that also is held the same weekend in Tampa, but in the unfortunate shadow of the men’s events. Our 10-day female-centric road trip first took us to Indianapolis, where Iowa locked up an automatic NCAA bid as Big Ten Tournament champs. We then took a first-time-ever trip to the Horizon League Basketball Tournament, the “Motor City Madness” in Detroit. While the Big Ten, a Power 5 conference, annually gets in multiple teams, the Horizon is a 10-school “mid-major” conference that usually only gets one qualifying team because its post-season tourney winner earns the automatic bid. 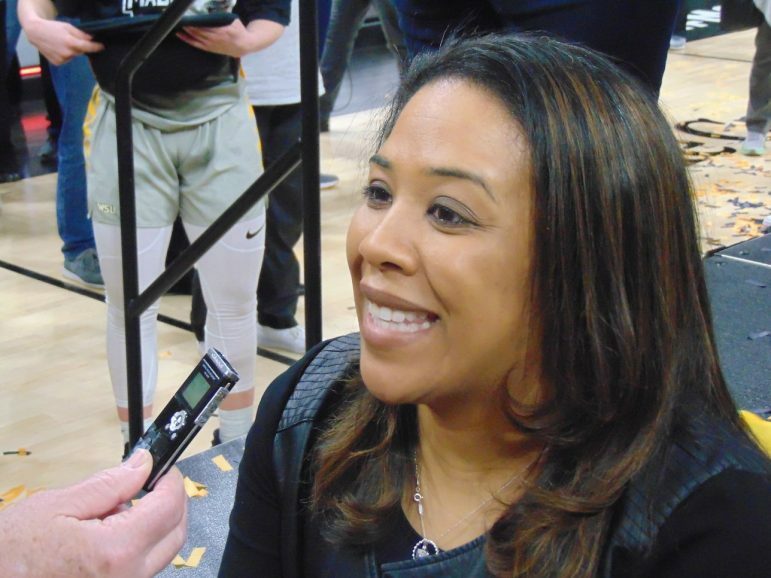 Upon our arrival, Wright State Coach Katrina Merriweather and her team instantly became our unabashed favorite — she was the only Black coach among the four semifinalists, and 10 of her 12 players are Black. The Raiders (27-6) last week completed a double-double, winning both the regular season and tournament titles. Her top-seeded club is ranked nationally first in total rebounds and third in rebounds per game: Wright State was ranked 10th in the latest women’s mid-major top 25 poll. Merriweather was named this year’s Horizon League Coach of the Year. “We have been working really hard for years for this to happen. Thank God it’s finally here,” stressed Merriweather, who was hired in 2016. Merriweather, University of Detroit Mercy Coach Bernard Scott, and University of Illinois—Chicago’s Tasha Pointer are the Horizon League’s only Black head coaches. Scott, during halftime of the tourney finals, told me that he’s rooting for Merriweather. “He always has been very supportive, and I of him also,” the Wright State coach said of Scott. After Wright State’s semifinals win, Merriweather reiterated that playing in the league tournament “is a huge deal. It’s great to play in this type of arena, this type of atmosphere. When we get to the NCAA tournament, this is the type of arena we would play in,” she predicted. There were no hopin’ emotions among the Wright State players and coaches this year: The Raiders on Monday got the 13th seed in the NCAA and will play fourth-seeded Texas A&M on Friday. “Yeah,” Minnesota Coach Lindsay Whalen told me a couple of weeks ago, after her team lost to Indiana in the Big Ten Tournament, when asked if she would accept a WNIT bit if offered. The Gophers (20-10) host Northern Iowa Friday at 6:30 pm. The Panthers (20-12) are coached by Tanya Warren, one of five Black coaches in the 68-team field.